Instrument P.I. : Michael Winter, University of Stuttgart, Germany. Technique: A high-resolution slit-spectrgraph which is fed by optical fiber attached to window assembly telescope. Scientific objective: Resolve shock emissions in the near-UV. 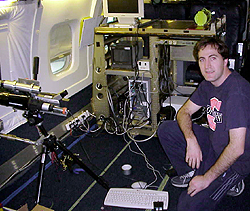 Instrument: The instrument consists of a computer controlled slit-spectrograph which is fed by an optical fiber and a small telescope assembly at the window. A co-aligned camera provides pointing capability, detecting stars to magnitude +7. The camera is an EM CCD Andor DU97 IN, back illuminated UV enhanced CCD, with 1600x400 pixels (16x16 micron) and 25.6 x 6.4 mm image area. The Spectrometer is an Acton Sp300i imaging spectrometer with 300 mm focal length F/D 4.5. The telescope assembly focussing is performed with a 90 degree off-axis parabolic mirror of 50 mm diameter with a focal length of 100mm. The F/D~2 was chosen to meet the numerical aperture of the fibre optics yielding an angle of view of 0.45 degree. A bundle of 50 quartz fibres of 100 �m diameter are chosen. On the telescope side the fibres form a round cross section of 0.8 mm diameter, on the spectrometer side they are oriented in a row which can be used like a slit with a height of 5.6 mm and a width of 100 micron. If sufficient amounts of light are available, a slit can be used in addition to improve the spectral resolution. Heritage: The same telescope assembly was deployed during the 2002 Leonid MAC mission, feeding a rack-mounted slit-spectrograph. Aircraft hardware requirements: Window swivel mount. Stow box. Rack mounted spectrometer and computer. Sensitivity: The Electron multiplier gain is 1 - 1000 times, the pixel read out rate 0.05, 1, and 3 MHz. Frame rate and exposure times: Maximum rate of spectra per second in full vertical binning mode: 328 up to 400 per second.